Bonsai Vision brings you our exclusive Kenji Miyata Collection, which includes a series of bonsai pots and trays hand selected by the bonsai master himself. Within this collection, you will find glazed and unglazed bonsai pots from 3 inches up to 25 inches wide, oval bonsai pots to rectangular bonsai pots, antique pots, yixing pots and much more. They are carefully selected for their color, shape, size, quality and unique finish. 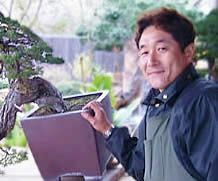 Kenji Miyata's vision of bonsai transcends that of most of us. He looks for unique qualities in a pot that, when paired with the right tree, a vision brings forth the beauty in a way that another pot would miss. Being one of the world's leading experts on bonsai styling and creation, we rely on his depth of understanding and knowledge when selecting pots to be added to this superior line. We trust you will find his collection to be like no other. Part of our mission at Bonsai Vision is to bring to you the very best that the world of Bonsai has to offer. We will continually be adding pots to this series that Kenji Miyata has deemed worthy to carry his name. Note: All of our pot dimensions are measured form the outside of the pot.